Thanks to Nia for submitting this great interview to Mixed Reader. 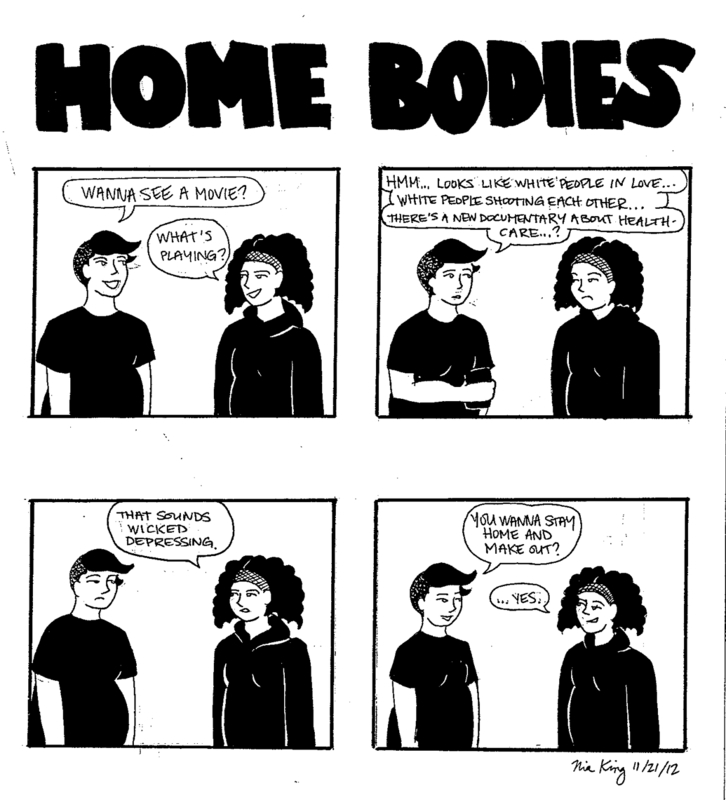 Check out her website at artistactivistnia.com, her zines and her comics at QTPOC Comics! She’s an artist and writer who explores the intersections of race, gender, and sexuality in a compelling and accessible way. Support her work! Nia King is multimedia producer with a passion for social justice. 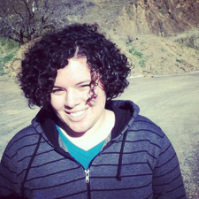 She started out as a zinester writing about mixed-race identity, made a short film about searching for trans-friendly housing in the Bay Area, and has recently transitioned into journalism. Her ongoing projects include a web comic about her interracial relationship, and a podcast about queer and trans art activists of color. Feminist textile artist Tali Weinberg, an MFA student at California College of Art, recently interviewed Nia for part of her thesis on women art activists in the Bay Area. Below is an abridged transcript of the interview. Do you consider yourself part of a certain activist or artistic lineage? As a queer, mixed-race woman of color who’s an ex-punk and an ex-anarchist I feel like there’s lots of different things that I draw from, some of which have nothing to do with my identity. Jaime Hernandez is definitely my biggest influence in terms of my comics. He and his brother do a series of comics called Love and Rockets. His branch of the Love and Rockets franchise is about these two young queer punk rockers growing up outside LA, I think one of them is Chicana and the other is Colombian and Scottish. For me as a young punk growing up in a white scene, seeing queer women of color represented in comics as actual people was a really amazing thing. I also really love the visual art. Every panel looks like something you could put up on a wall, which is not something you see with all comics. There’s a really strong graphic style with a lot of solid black and white shapes that are really sort of distinct visually and that’s something I also really draw from. When something is racist or sexist but also entertaining or creatively inspiring, how do you negotiate that? And that’s very much true if you’re a queer person or a person of color as well, you have to choose how you’re going to engage with popular entertainment, if you’re going to engage with popular entertainment. You can choose or try to extract yourself from it, but a.) it’s a very difficult thing to do, and b.) are you still relevant if you’re not engaging with the culture, the mainstream culture, in any meaningful way? I don’t think you have to listen to Flo Rida or whatever to be relevant, but it does sometimes help, if you want to change the culture, to know what’s going on in it. I’ve been thinking a lot lately about the phrase “putting your body on the line.” I’ve been thinking a lot particularly about Occupy last year, and the very white, male front line of Occupy. At the time I felt like “I really want this to be my movement, and it’s not.” As a woman, what does it mean to put your body on the line, and when is your body on the line? How is art potentially part of that or not part of that? I generally try to keep my body as far away from the line as possible. [Laughter] “Putting your body on the line” is such an interesting expression, and also I think an expression of privilege in a lot of ways, because if you are putting it on the line voluntarily, that’s very different than it always naturally being a site of battle. I have a lot of experience with white anarchists looking for fights with the cops because that’s how they measure their radicalism or their viability as activists. That’s not something that, for the most part, women, poor people, people of color, people with disabilities and trans folk can do. I mean some do, and I don’t want to diminish that, but it’s really different to consciously make a decision to engage with the police in the streets if you’re a person who deals with street harassment, with police raids, with stop-and-frisk on a regular basis. Being in community with trans folks and being in a relationship with my partner, has made me think really differently about privilege and the privilege that I have. I used to think, “I’m queer, I’m a woman, I’m a person of color, I’m young, I’m sort of disadvantaged in all these ways.” But I’m also light-skinned, middle-class, perhaps sometimes straight-passing, and cisgender. When you’re walking down the street with someone who is trans and every guy you pass has to say something to them, you become really aware of how invisible – and in my mind privileged, because for me invisibility (freedom from unwanted sexual attention) is a privilege – that you are. How do you define your role as an artist in society? A lot of my work focuses on microaggressions, especially in my earlier zines like Angry Black-White Girl. Racism is often portrayed as something that’s very obvious, outright and easy to identify, and a lot of times racism is not like that. Sometimes, it can be really hard to put your finger on, even if you’re the one experiencing it, which can make you feel crazy. I hope my work will add a layer of nuance to conversations about race in our society by showing that it can be subtle as well as overt. I do a comic about my relationship with my partner. He’s a white trans man, he’s currently transitioning with hormones. Each of the comics is for the most part just a cute little story, I don’t try to make them light or try to make them heavy, but because he’s trans and because our relationship is an interracial relationship race and gender do come up. I could have chosen to draw myself with darker skin so people would recognize me as a person of color, but I felt weird about that, and also, I wanted to challenge that people think they know what a person of color looks like, or what a man looks like. I think just presenting an image of a person with breasts and saying “this is a man,” is inherently a political act. Yeah. I think we like to assume that we all understand that everyone’s life matters, but the policies and that practices that we have, from stop-and-frisk to this law that just passed in Arizona saying that transgender people can’t use the bathroom of the gender they identify with, make life so much harder if you are queer, or trans, or brown. The value of your life and your life expectancy are very much impacted by everything from the kind of representations that exist of people like you on TV to interpersonal violence to microaggressions to policy. It’s all related. And it starts at the level of representation.